It's been a little while since my last post... I have been so busy with work that I haven't had time to take pictures of all my latest sewing accomplishments, never mind writing about them!!! First of all, I used the Jane pattern from BurdaStyle and the free Madeleine pattern from Colette Patterns to create a lovely satin lingerie set for a friend for her upcoming wedding shower. I used both parts of the Jane pattern to create some jammies for myself as well (these were actually a muslin to test the fit of the Jane pattern). The top was actually an upcycle from an old, old nightie I received for Christmas nearly 20 years ago. I should try to find a photo from Christmas 1993 just so you can see the nightie in it's shining glory (plus it would be a good laugh I think! ), but here is a photo of it in its well-worn status pre-upcycle. I ran in the South Okanagan Wine Association's first annual Half Corked half marathon with a few friends the other weekend. What a blast! The route was 17.5km along the beautiful wineries and vineyards between Oliver and Osoyoos. I entered with a few friends and we opted to do a Disney theme for our costumes. With my short, dark hair and pasty white complexion, Snow White was an obvious choice (lol). I recently got a job where I work 4 10-hour days and then get Fridays off, but needless to say I don't accomplish much during Mon-Thurs. I wanted to make my costume from scratch but didn't have enough time... I borrowed some yellow shorts from a friend, and then embellished a navy tank top with some baby blue jersey sleeves and a white satin collar. It turned out pretty good and was easy to run in (although I did get a heat rash on my legs though...that sucked). 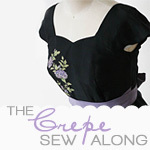 I've got a few more projects to blog about, but those will have to wait until I can get my hubby to take some photos! So that will give you something to look forward to!